So, you've all heard about Google Glass and smartwatches, and how they're going to 'revolutionise technology as we know it'. 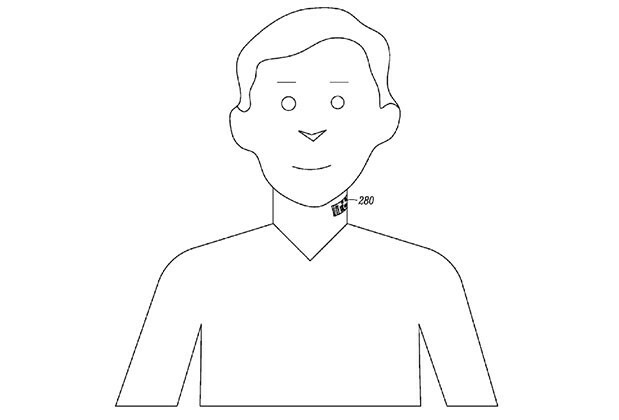 Well, Motorola is hoping to trump them all by designing and producing a neck tattoo that doubles as a microphone. The tattoo would be placed on the throat and would register the sounds and vibrations made by the users voice, which would then be send to a smartphone wirelessly. The device would use a battery that "may or may not be rechargeable," said Motorola. They also suggested that Bluetooth charging could be used, or near field communication (NFC) as another alternative charging method. What's more, the tattoo wouldn't just be limited to humans. The patent read, "It is contemplated that the electronic tattoo 110 can also be applied to an animal as well." The patent was filed last May last year by the U.S Patent and Trademark Office, and was titled: "Coupling An Electronic Skin Tattoo To A Mobile Communication Device." The tattoo would either communicate to the smartphone using Bluetooth, Wi-Fi or NFC, and could potentially eliminate any background noise that often occurs when in busy, public places. "Communication can reasonably be improved and even enhanced with a method and system for reducing the acoustic noise in such environments and contexts," the patent reads. The idea is slightly bizarre to say the least. The world is just getting used to the idea of wearable technology, so the idea of technology embedded in the skin seems rather futuristic. Furthermore, it's simply a patent, which means it's not set in stone. This means it may be a while yet before we see such technology enter the mainstream market. What are your thoughts? If such technology were ever released on the market, would you consider purchasing it? Let us know in the comment section below.